Indian Classical dance forms are performed all around the nation and even abroad. Each dance form belongs to a particular state where it is believed to have originated. Bharatnatyam is a great classical dance performed for the worship of gods and goddesses while kathak has its traces from the gatherings of prince and kings. The word ‘Bharatanatyam’ is derived from three primary ideas of Bhava, Raga and Thalia. It is said that Lord Brahma came to Bharata, the sage who then presented this sacred dance in an Indo-Aryan text known as the Natya Shastra, which gives the formation of Bharatnatyam dance form. – Folk dances are performed for every possible occasion to celebrate Indian festivals, wedding, the birth of a child or any reason for happiness. – Folk dances are performed very easily with a minimum number of steps or movement. Indian folk dances are performed with a lot of energy. – Some dances are performed separately while in some performance couple dance together. – Each form of folk dance has represented a specific rhythm and specific costume. Most of the costumes worn by dancers are very colorful with extensive designs and jewels. – Western dancing is a great energetic and fun activity. It is helpful in improving the body’s core muscles. – Western dancers are required to carry out a number of energetic steps and moves across the dance floor. Western dance offers the best way to strengthen the body’s core muscles. – It potentially reduces blood pressure and helps to prevent osteoporosis. It is also helpful in improving the body’s core muscles. 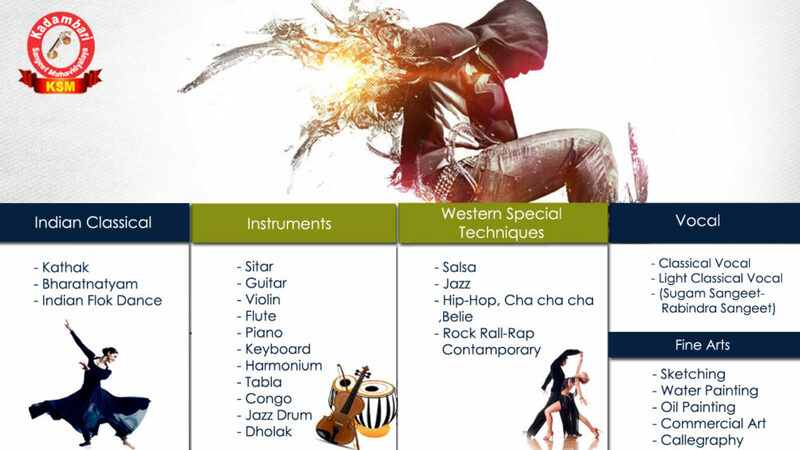 We are one of the esteemed institutes who provide Western dance classes in Delhi, Noida, Ghaziabad to the Western dance aspirants. Tango is called as the Argentine dance is one of the famous Western dance forms. Kadambari Sangeet is one of the top institutes who provides Salsa dance classes in Delhi, Noida, Ghaziabad to learn this beautiful dance form. Salsa is a lively and joyful partner dance.